These Louvre Blade Blade Balcony Screens are manufactured from 100mm aluminium aerofoil Louvre Blade and aluminium components. The fixed screens are popular for all types of developments. These balcony screens are designed to comply with RES code requirements and allow for 25% over looking when standing on the balcony. The view is restricted when looking down, but not when looking out and up. Second option - panels fixed between 80mm x 40mm support posts with a matching top rail for extra strength. They are a very popular screen, allowing for natural air flow and light into the space or outdoor area. This is not achieve from obscure glass screening.These screens are available in natural anodized or your choice of powder coat colours to complement any colour scheme. Our most popular screen. These fixed Louvre Blade Window Screens are manufactured from 100mm aluminium Louvre blade. Aerofoil Louvre blade window screens are designed to comply with RES code requirements when overlooking neighbouring properties. The aluminium louver privacy screens are as unobtrusive as possible, and are designed to provide privacy and security. They also control weather conditions such as heat or wind, and provide better airflow. They let the light and airflow into the room. This is an ideal product for your project. These screens have a typical stand-off bracket of approximately 200mm to allow for cleaning of the window glass. These Vertical Louvre Blade Balcony Screens are manufactured from 100mm aluminium aerofoil blades components. These fixed blades are set in the vertical position to allow for panoramic viewing. These screens are a popular option for coastal developments where it is a requirement to screen the neighbouring property, but want to retain the water front views. Louvre blade vertical screens are the best option for ensuring views are retained. These Baton Style Window Screens are manufactured from aluminium with a 65mm x 16mm baton, and approximately 16mm gap in between the slats. They allow for the required 25% overlooking view, complying with RES Code requirements where overlooking and privacy is an issue. They also allow air flow and light into the space, and have a typical stand-off bracket of approximately 200mm to allow for cleaning of the window glass. These fixed Louvre Blade Sunscreen awnings are manufactured from 100mm aluminium aerofoil blade and aluminium components. These sunscreens are mounted horizontally above your windows in north and west facing applications. These screens shade and protect the home from the harsh Australian summer sun whilst allowing autumn and winter sun and warmth to penetrate into inside living areas. These sunscreens are manufactured the length of the window and to any required depth. These Louvre Blade Feature Screens are designed to provide a contemporary style, plus enhance the look of your home or development. These feature screens can give the house or development the finishing touch. They can be manufactured in 100mm or 150mm aluminium aerofoil blade or any extrusion that is available. The Pivoting Blade Shutter Panels are is manufactured from 100mm aluminium aerofoil louvre blade and inserted into a frame to conceal the mechanism and give structure to the product. 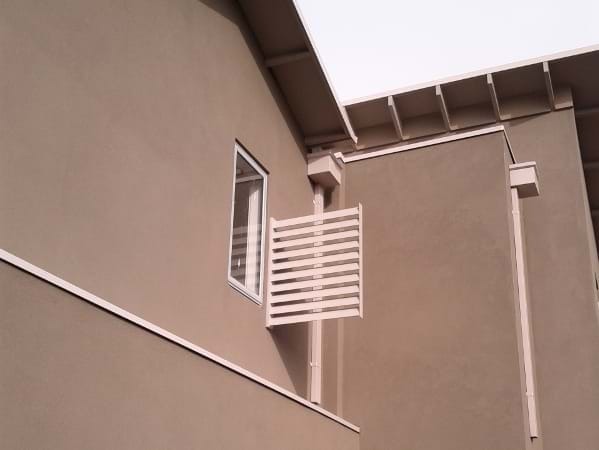 These shutter panels are ideal for both al fresco areas and balconies. Having these shutter panels allow you to shade an area from the hot summer sun, or to protect your deck or living area from harsh elements. This will ensure your living areas are pleasant, and have a controlled temperature year round. 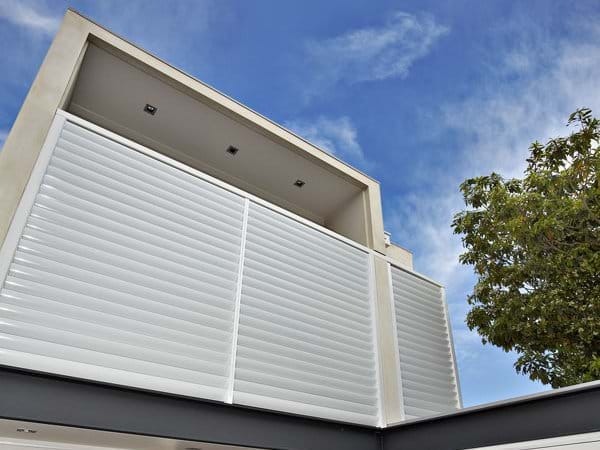 Atrium Louvre Blade Shutter Panels are a great solution for radiant summer heat problems associated with glass atrium and skylights during Australia's hot summers and cold winters. These panels are manufactured from a 90mm aluminium aerofoil blade set in a self supported rigid frame. These panels are a great addition to your glass roofed living areas or skylights. The atrium shutters protect internal living areas and furnishings from the hot summer sun, while still allowing natural light into the living areas. In winter simply adjust to allow the warm winter sun in, or close in the evening to control heat loss from the house. Baton Style Balcony Screens are manufactured from aluminium with a 65mm x 16mm baton, with approximately a 16mm gap in between the slats. They allow for the required 25% overlooking to comply with RES Code requirements, where overlooking and privacy is an issue. These balcony screens are generally supported by a 50mm x 50mm support post with an aluminium top cap. They allow air flow and light into the space or outdoor area, which isn't an available feature when using fixed obscure glass screening. They can be manufactured to have an access pedestrian gate option also. These are ideal for hiding external plant and equipment areas, i.e. air-conditioning units / hot water systems, garbage bins, or anything you don’t wish to see. These screens provide a clean line look and uniformity that is a great option for multi-unit developments. Clear View Louvre Screen Blades don’t have a frame as such, as they have individual brackets for each blade mounted back to the wall. This screen gives a unique and formless look from the outside. 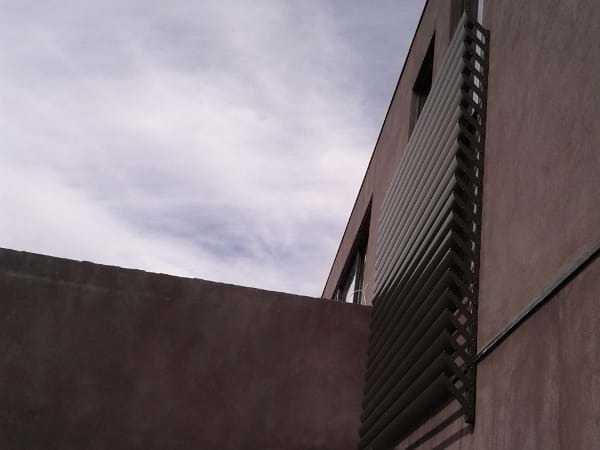 The Perpendicular Cantilever Louvre Blade Screens are ideal for side view issues, and can be mounted to the existing wall on the side to prevent overlooking or sun issues. Modem shrouds are extremely popular in today’s architecture. They can be manufactured in a variety of profiles (Thickness) Example 6mm, 30mm,50mm,75mm, and the depths can be as small as 200mm Deep up to 600mm in depth. These Shrouds are available in natural anodized or your choice of powder coat colour to complement any colour scheme. Aluminium window shutters are a fantastic option to replace old external shutters to heritage homes in and around Melbourne, We have managed to replicate the old timber shutters in aluminum almost exactly the same proportions. Once they are powder coated to your chosen colour it is difficult to recognize the difference from the timber shutters. There is an enormous advantage choosing this product over timber, No more constant maintenance ie warping splitting cracking and the ended less panting. And of cause Aluminium isn’t going to rot out as timber eventually dose. To get a quote on this product Simply measure your existing shutters and send them to us on the request a quote page and don’t forget to include a photo if you can.